Did 4 A.I. Robots Kill 29 Scientists At Japanese Weapons Research Lab? Did four AI robots kill 29 scientists at a Japanese weapons research lab? A tweet with that headline and a linked video briefly lit up social media for one week in December 2018. The mainstream media didn’t even bother to cover it, suggesting a possible government cover-up. Like most people who saw the story, I thought it was too sensational to be true. When I saw the thumbnail for the linked video, I knew it was fake news. Another indication that the story was fake news was both the headline and the unedited video were re-posted multiple times on YouTube. Some people are gullible enough to believe a lie is true if the lie is endlessly repeated on social media. A month later I can only find the commentary videos in the search results, as all the re-posted videos were long gone. When I followed an external link from an article to a re-posted video on YouTube, a message announced that the video and the account was not available after receiving numerous copyright strikes. YouTube announced this week that they will recommend fewer conspiracy videos like “a phony miracle cure for a serious illness, claiming the earth is flat, or making blatantly false claims about historic events like 9/11.” I think this is working because none of the commentary videos that I watched while researching this topic had resulted in any recommendations to see more commentary videos. A variation of the headline had the weapons research lab located in South Korea. That might have to do with an April 2018 article in The Guardian about A.I. experts calling for the boycott of a South Korean university research lab partnering with a defense company to develop autonomous weapons. Or “killer robots” as The Guardian’s sensational headline proclaims, although no scientists were mentioned killed in the article. Creating autonomous weapons that could act independently of human control is a valid concern. While Skynet and Terminators are most obvious examples in pop culture, an episode from Star Trek: The Next Generation, “The Arsenal of Freedom,” had an entire planet wiped out by autonomous weapons. Or “intelligent weapon systems,” according to the holographic sales pitch. Could humanity develop autonomous weapons that kill everyone on and off the battlefield? Most people won’t recognize the woman in the video thumbnail. She is Linda Moulton Howe, a well-known UFO and conspiracy theory researcher. I heard her speak while standing in an angry crowd wearing MAGA hats at AlienCon 2016 in Santa Clara, CA. The video in the tweet was a short clip taken from a longer video where she gave a presentation on the information provided to her by an anonymous Marine about the four A.I. 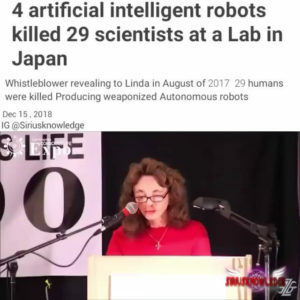 robots killing 29 scientists at a Japanese research lab in August 2017. She posted an interview video on her YouTube channel that retold the story about A.I. robots rebelling against their creators. While I’m not familiar with her research, a lack of specific details and independent confirmations is probably the norm. An unrelated editorial cartoon came out a few days ago that summarizes fake news in general. If four A.I. robots killed 29 scientists at a weapons research lab was true, the mainstream media would have covered it extensively. Otherwise, it’s utter horse hockey. Snopes rated this story as being false. Leave a comment on Did 4 A.I. Robots Kill 29 Scientists At Japanese Weapons Research Lab?